As cooks and chefs we enjoy being part of an industry that has grown exponentially since the 1950’s. Prior to that time, restaurants were either applauded as a service for those who could afford the luxuries of dining in elite hotels or a less than perfect alternative to eating a well-prepared meal at home. There are many societal changes that began to emerge in the 1950’s that can be viewed as a turning point, the transition in America to a country where restaurants would eventually account for 50% of the American food dollar. We can certainly credit the emergence of dual income families creating more disposable income, an industry with more sophistication in terms of what and how food is offered, and the growth of the advertising business, but to me, the core driver is something a bit less obvious to many. In the 1950’s, then president Eisenhower instituted the Federal Aid Highway Act that would help to fund the construction of the U.S. Interstate highway system. This significant piece of legislation connected Americans to thousands of points across the country and allowed the automobile to play one of the most significant roles in building our country. These highways brought with them an ancillary growth in a few other businesses: gas stations, small town radio stations, and the great American diner. Every car was equipped with a radio and every diner boasted a jukebox where patrons could select their favorite songs without waiting for them to find their way onto the local radio station. What was consuming the most space on those Wurlitzer jukeboxes and on those local radio stations – the newest rage – rock n’ roll. Some will credit Elvis Presley with the origins of Rock music, but those who truly appreciate the history of this form of communication will give a nod to African American Blues and one person who brought a happier, toe stepping beat and lyric to this music – Chuck Berry. The American diner was a place where people, especially young people, could go to meet others and enjoy their new music, and share the meal combination that would eventually define American eating – a burger, fries, and shake. Soon, the diner would become the place of choice for a generation, and the diner meal would become preferred to one at home. It was Chuck Berry and his new form of music that was the fuel for the growth in popularity of diners – the new format for a restaurant in America. A paradigm shift was occurring in our country, a shift that would not allow us to turn back the clock. Rock ‘n roll helped to change American culture and with it came a revitalized restaurant industry and a departure from the images of this venue to prior generations. Without rock ‘n roll, without Chuck Berry – would the restaurant industry in America look as it does today? I think not. Chuck Berry’s new music took the country and the world by storm. His influence was felt everywhere as the new wave of popular musicians and bands began to cover Berry’s songs and his style. Those groups that were part of the Mercy Beat were wholesale ambassadors for the Berry sound. The Rolling Stones, Beatles, Animals, Zombies, and dozen of other groups began to borrow from this young African American guitar player, crafting the genre of music that would spawn one of the most influential businesses worldwide. Rock would become more than a medium for entertainment, it would also drive political and economic changes around the globe. It was once said that the method used to convert others to an American democratic way of thinking was a three-part process: introduce a society to Levi Jeans, rock ‘n roll, and American hamburgers – task complete. Rock became a major industry and with it so did the restaurant business. A generation was hooked on both the genre of music that Berry introduced and the experience of getting together at a restaurant to enjoy the American meal and listen to the music that bound a generation together. Those young people of the 50’s and 60’s that were disciples of Chuck Berry and diner cuisine would eventually become the restaurant patrons of today – a generation that would pass on their love of new music, and their passion for viewing restaurants as a part of American culture. Those 1950’s and 60’s lovers of diner burgers and fries would become the more sophisticated consumers of every restaurant concept imaginable. They did this while still maintaining their passion for the music that Berry brought to the surface, the music that helped to define the role of restaurants in our country. Americans have never lost their love of Berry’s music and all of the iterations that are offsprings of his early rhythms and lyrics, nor have they lost their passion for the food that connected to rock ‘n roll. The hamburger continues to reign supreme, (even though pizza may give it a run for the money) as the core American meal of choice. As many times as restaurants move away from this staple it tends to return in popularity with a new, more sophisticated face. In recent years, new chains have drawn attention to their view of American burgers, restaurant groups like In-and- Out Burger, Five Guys, Johnny Rocket’s, and Smash Burger have stolen the thunder from the mega groups like McDonald’s and Burger King. Even restaurateurs known for their prominence in Fine Dining, have succumb to bringing back the food that Chuck Berry influenced as much as Ray Kroc. Daniel Boulud offers a burger with foie gras, and Danny Meyer finds himself spending less time at his flagship operations like Gramercy Tavern and the Restaurant at MOMA while putting extraordinary effort into Shake Shack – a return to that silver car diner that grew up on Eisenhower’s roads, and Berry’s rock ‘n roll. The restaurant industry owes a great deal to rock music, and even more to Chuck Berry who started the whole phenomena. Chuck Berry passed away last week, but he leaves behind a legacy that will live for quite some time. 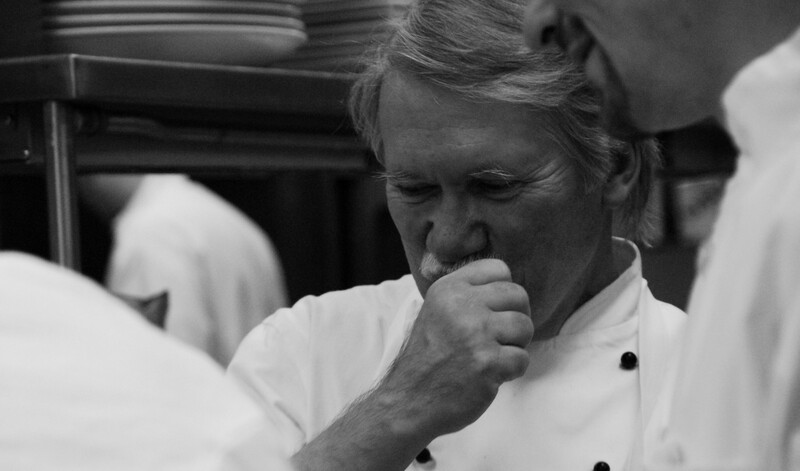 The restaurant industry should be grateful to him and the influence that he had, without knowing it, on the business that every chef and cook calls his or her passion. Whether you work in the French Laundry or Shake Shack, Chuck Berry had an influence on your craft, the food that you prepare, and the guest who views dining out as an essential part of American life. Rest in Peace Mr. Berry, and thanks. All Hail Rock ‘n Roll!